Saudi Arabia's First Arab Fashion Week Kicks Off, Beyond Fashionably Late : Parallels The fashion show, which only women are invited to view, is the newest entertainment opportunity to emerge in the ultra-conservative kingdom. 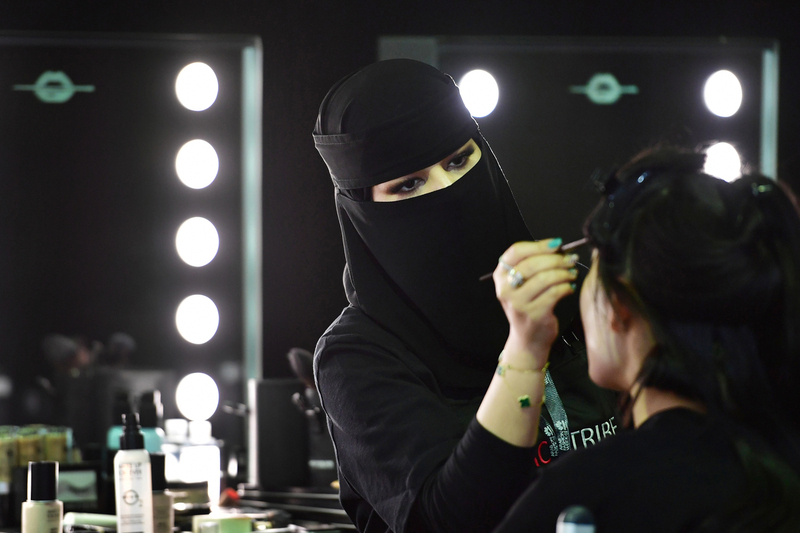 A Saudi makeup artist preps a model backstage during Saudi Arabia's first Arab Fashion Week in Riyadh. 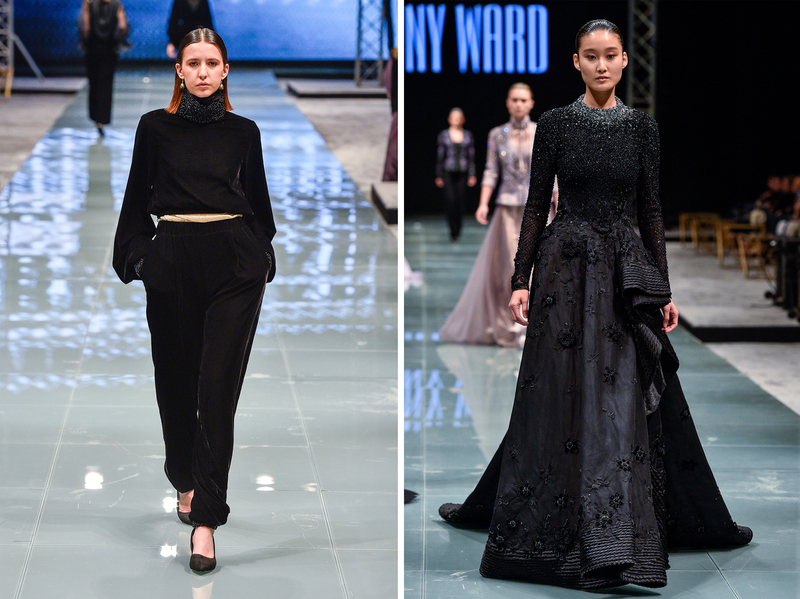 The first gowns by designers like Lebanon's Tony Ward and Bibisara from Kazakhstan were ultra-feminine — with long trains and an emphasis on sequins, feathers and beads. "Saudi women like the European style, they like to look like European women," he says. "They like the handmade finishing. And the special dress, they don't like to be like someone else." 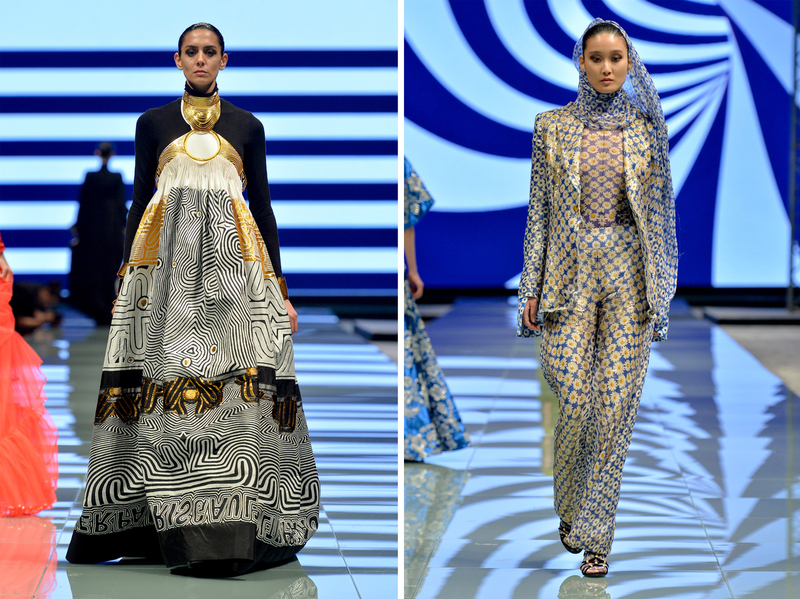 Jean Paul Gaultier was one of the big designers to participate in Saudi Arabia's first Arab Fashion Week in Riyadh. Jacob Abrian, the CEO of the Arab Fashion Council, the Dubai-based company organizing the event, says Saudi princesses are the biggest collectors of haute couture in the world. 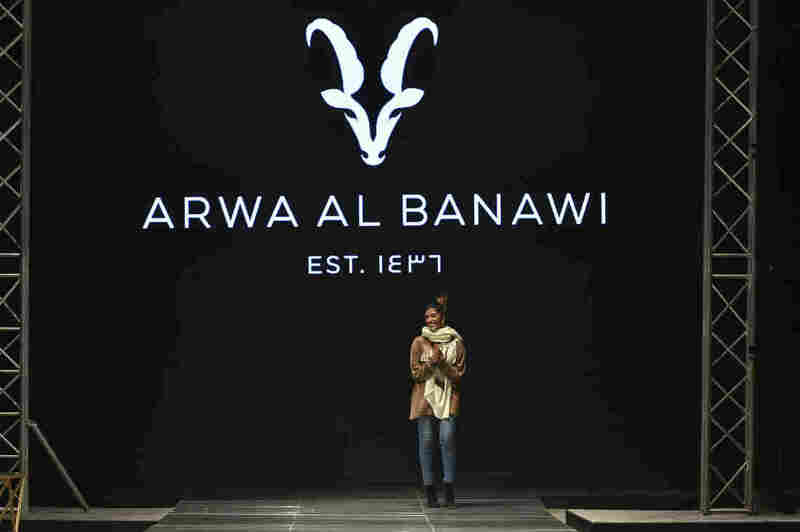 Abrian says it's not surprising Riyadh would see its own fashion week. "We decided to host a fashion week in Riyadh, considering the fact and the importance of Saudi Arabia as hub for the Arab world and as the most important markets in the Arab region for the fashion industry," he says. He adds that the country's relatively large young adult population and purchasing power are appealing for the industry. The list of designers include big names like Jean Paul Gaultier. Most are from Europe or the Middle East, along with some from Brazil or the United States. Several are from Saudi Arabia, including Arwa al-Banawi. She says her designs, including women's business suits, send a strong message about female empowerment at a time when Saudi Arabia is lifting harsh restrictions on women driving and working jobs. Banawi says it makes sense to have a fashion week in Saudi Arabia now because of all the changes happening in the kingdom. "It definitely is inspiring to me because women now want to become independent, they're working," she says. As a designer, Banawi says she wants to make life easier for an independent woman "who is juggling between her life, family, going to work." The government has recently taken strong steps to curb rampant corruption in the kingdom, including rounding up more than 200 of Saudi Arabia's wealthiest and influential people and detaining them for about three months at the luxurious Ritz Carlton hotel — the same venue where Fashion Week is being held through Saturday. NPR's Fatma Tanis contributed to this report in Riyadh.